Your body needs glucose, which you get from carbohydrates in your diet. However, eating foods high in refined carbohydrate, such as cookies and white bread or rice, can trigger a large release of the glucose-regulating hormone insulin. This leads to abrupt rises in blood sugar followed by steep declines. A drop in blood sugar can make you feel tired, hungry and agitated. To keep your blood sugar balanced, it's essential to choose the right foods and combinations so that insulin stimulation is gradual. When you choose carbohydrates, opt for fiber-rich foods such as whole grains, vegetables, beans and other legumes. Fiber helps slow the absorption of glucose by slowing down how quickly food leaves the stomach and enters the small intestine. This effect prevents a dramatic insulin release because it causes glucose levels to rise gradually. It may reduce post-meal glucose levels and benefit insulin sensitivity as well. You should include protein in your meals and snacks to help keep blood sugar levels stable, notes the University of Rochester Medical Center website. Protein takes longer to digest, so it also slows glucose absorption. Foods that digest slowly have a less dramatic affect on insulin secretion. If you eat carbohydrates, such as fruit juice by itself, it may cause your blood sugar to rise too rapidly and fall quickly. 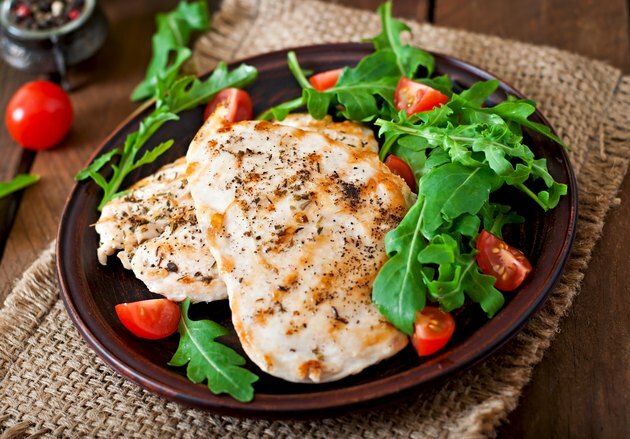 Choose lean protein sources such as fish, skinless chicken and turkey, low-fat cheese, beans, soy products and lean cuts of beef. Along with protein, fat also takes longer to digest and, thereby, slows glucose absorption. The goal is to limit unhealthy saturated fats, which are found in refined meats, high-fat dairy, lard and other processed foods. Balance your meals with healthy unsaturated fats, which are found in avocados, olives, fish, seeds and nuts. Use cooking methods, such as broiling, which don't require extra oil. Drizzle nutritious oils, such as flaxseed oil, over your salad instead of traditional salad dressing. Balancing your meals with healthy fats, lean protein and high-fiber carbohydrates is a good way to avoid sharp rises and steep declines in blood sugar levels. Prevent dips in blood sugar between meals by choosing snacks with a mix of protein, carbohydrates and fat, such as low-fat yogurt with fresh fruit or reduced-fat cheese with whole-grain crackers. Avoid skipping meals because your blood sugar drops when you go too long without eating.